The jungle trail was a complete surprise: dark and mysterious, secluded. Above the crowds, behind the cable car station and costumed tourists, we walked among thick-stalked bamboo and tall pines, a wall of leafy ferns protruding from the cliff side to our right, brushing our shoulders. The rise and fall of cicada song and the buzzing of busy bees were interrupted only by a melodious bird species that signals an intent to chirp by first sounding a long, rising-pitch siren call followed by a rapid series of tweets. An occasional cool breeze found its way through the thick foliage to provide moments of relief from the steamy heat. 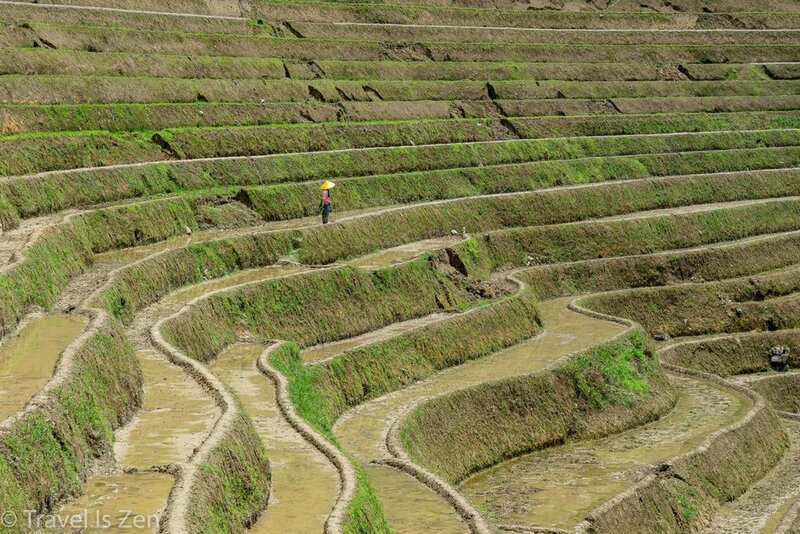 Moss-covered irrigation channels criss-crossed the path, funneling water down the "Dragon's Backbone" ("Long Ji" 龙脊) to flooded rice paddies. 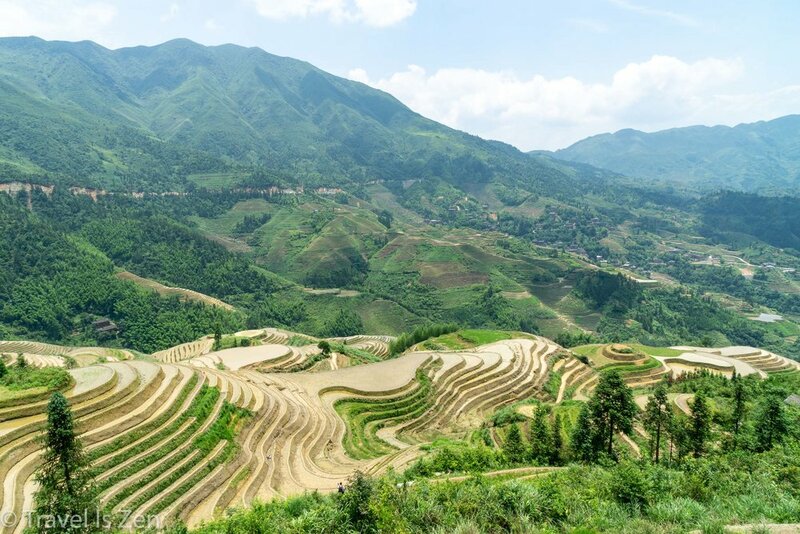 The Longji Rice Fields are nestled in a broad river valley; terraced paddies cascade 2000 feet down the low foothills of a steep mountain range. 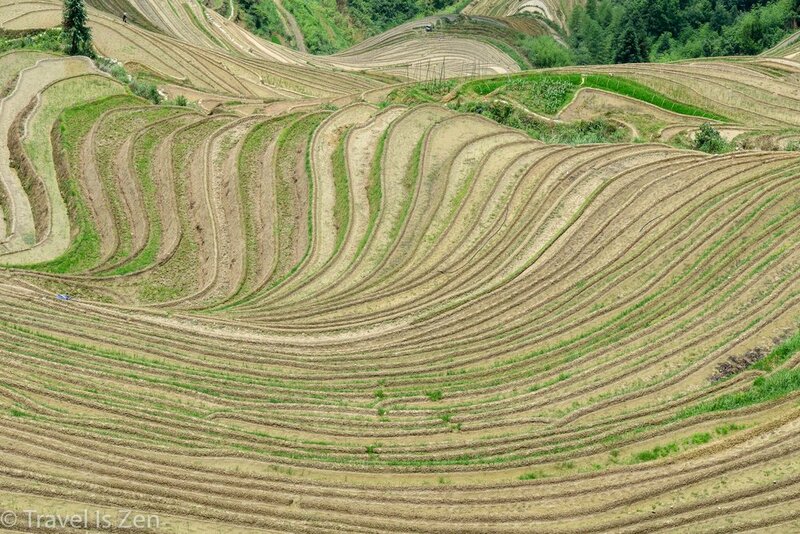 Diligent farmers of the Ping'an and surrounding villages shaped these fields by hand and have maintained their masterpiece for over 700 years. After scrambling off the bus earlier that morning and picking our way through the village and up a dusty dirt road, we eventually chose a single-track path leading up through the fields. There are many routes to the top, so the bus loads of tourists disperse fairly quickly. It was not crowded until we all aggregated again at the upper cable car station. The trail we found on Maps.Me loosely followed a ridge counter-clockwise from the cable car station, around the upper layers of the fields and sometimes climbing up into the forest areas above. We followed the trail for about 10 kilometers, eventually choosing a route leading to the village area on the opposite side of the valley. 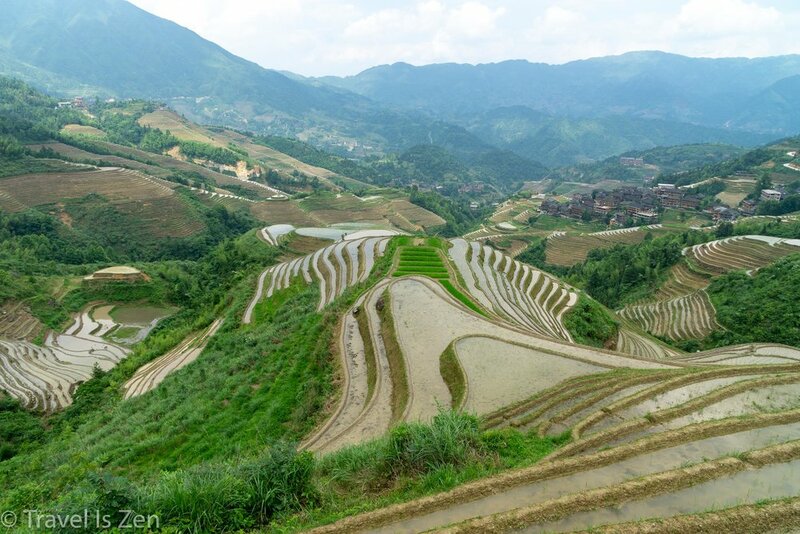 From this vantage point, we had an expansive 360 degree view of the entire Longji Rice Terrace complex. From here, we ambled down hundreds of stone stair switchbacks, winding through clustered home stays, inns, shops and restaurants, eventually reaching the valley floor. We found our way back to the bus station in time to down a cold beer before heading back to Guilin. Although the majority of tourists choose to stay in one of the local homestays for the night, my calves were happy to be heading back to flat land.